Come join us for the opportunity to explorer Baja’s Pacific Coast. 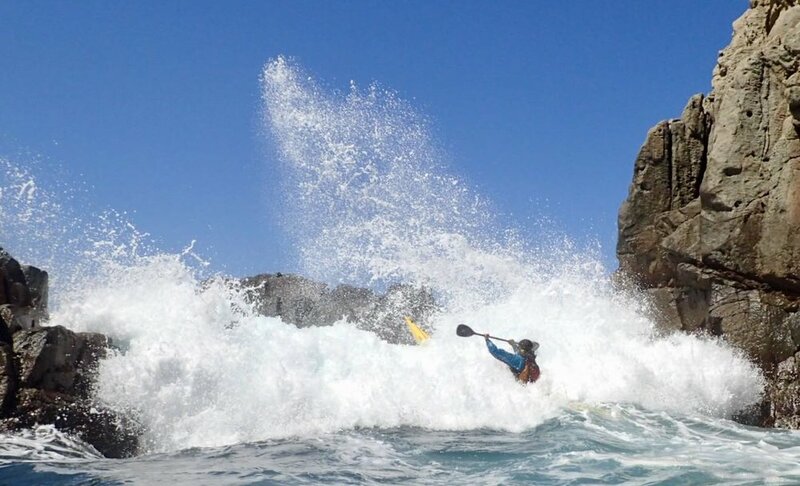 This is a rough water trip for sea kayakers with a degree of experience. 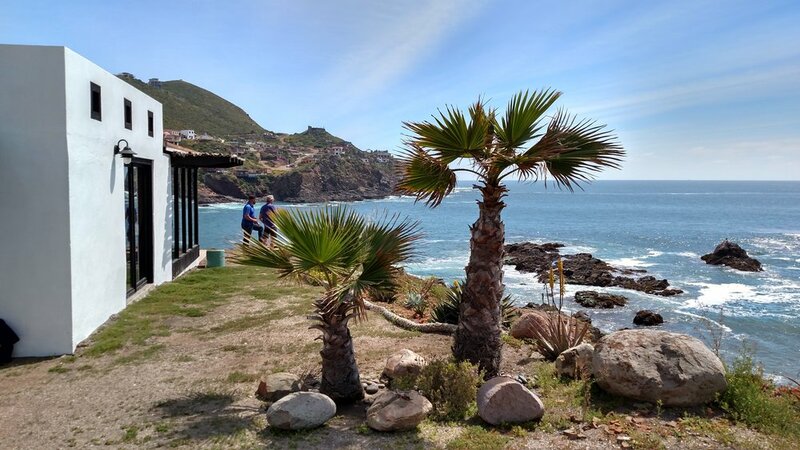 Our location is La Bufadora, a rocky peninsula that juts into the Pacific Ocean and provides the perfect playground for kayakers! 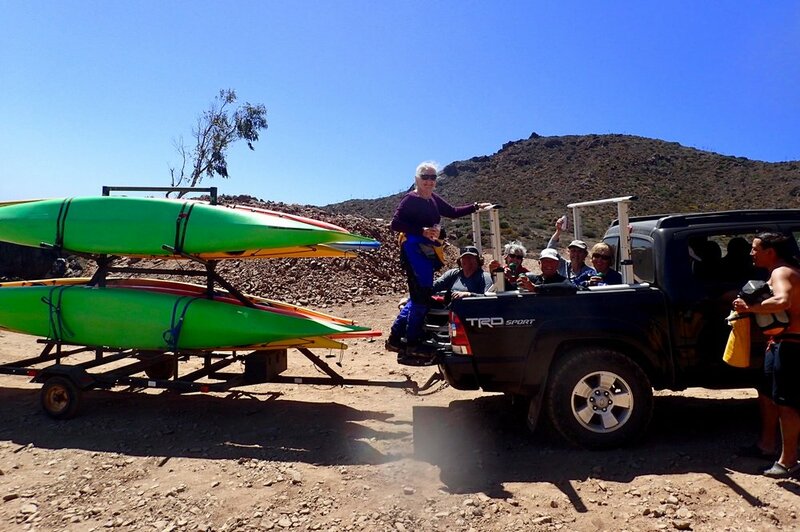 We will offer fun instructional daily trips that will improve your ocean paddling with a focus on rock gardening. Increase comfort in conditions and learn the skills needed to paddle in these dynamic areas. Whether you feel like pushing yourself, gradually testing your skills, or sitting back and watching, this is a great opportunity for ocean play. The Trip: 6 Nights accommodations & 5 days of paddling including kayak rental. All meals are included except a couple where we go out (tacos on travel days and 2 dinners not included) Cost $900 (if using PayPal fees apply) Round trip transportation from San Diego is provided. To keep things fun and personal, we are limiting this trip to 10 participants. The main house overlooks the ocean and has a full kitchen and living room with plenty of space to comfortably hang out. The back of the house features two shared bunk rooms that sleep apx 6ea and two bathrooms with showers. 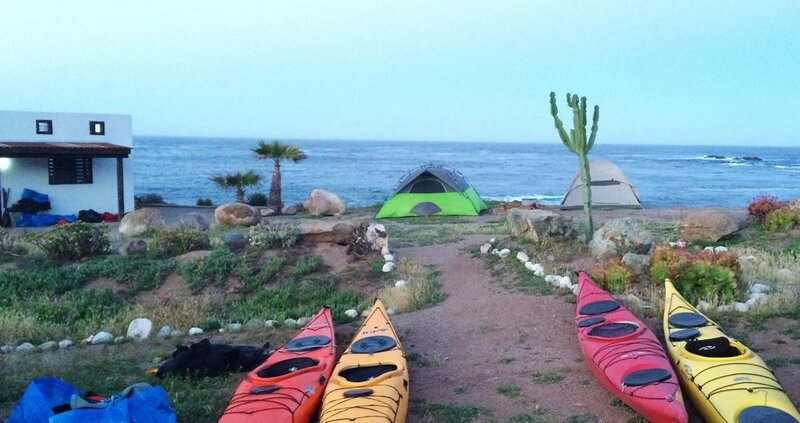 Camping: Set your tent up on a bluff overlooking the Pacific, making this more a private room overlooking the ocean than a roughing type of experience. Our primary launch site is just below this bluff, with other paddling options a short drive away. 10:00am: We will pick up from hotels near Jen’s and drive to our meeting spot at her house house. Here are some nearby hotels where we can pick you up. I personally like the Best Western Mission Bay, its close by and has a great breakfast, but no airport shuttle, Uber. 11:00am: Leave from our San Diego meeting spot, stopping at the San Diego airport if needed. If you are staying at an airport hotel, please take the hotel shuttle and meet us at the airport. For those driving to San Diego, please plan on arriving at Jen’s by 10am, we will have room to transfer your gear & kayak (if needed) to our vehicles and your car can be left there for the duration of the trip. If you prefer to follow us in your own vehicle, be sure to get mexico insurance. Monday - Friday After our breakfast and pack-your-own-lunch buffet (included with registration) We will gear up and go play in the ocean. After paddling you can wander up to town and check out one of the largest blowholes in North America or relax in a comfy chair by the ocean. Saturday: 9am Depart to San Diego If we leave at 9am coming home, it's reasonable to expect to arrive at the airport at 2pm. However, the most unpredictable part is the border wait back into the US, probably an hour, but you can never be sure.....It's best to schedule flights out of San Diego with LOTS of spare time. We will do a drop off at the airport where you can catch a hotel shuttle to your hotel if you decide to extend your stay in San Diego. Jen lives north of the border in San Diego where she has owned and operated sea paddlesports companies for over 20 years. Jen acheived the highest coach ranking within the British Canoe Union in Nov. 2007 when she became the first American Level 5 Sea Kayak Coach. She also holds BCU 5 Star sea, 4 Star surf, and 3 Star open canoe awards. She appears in Cackle TV Productions "This Is The Sea 4". 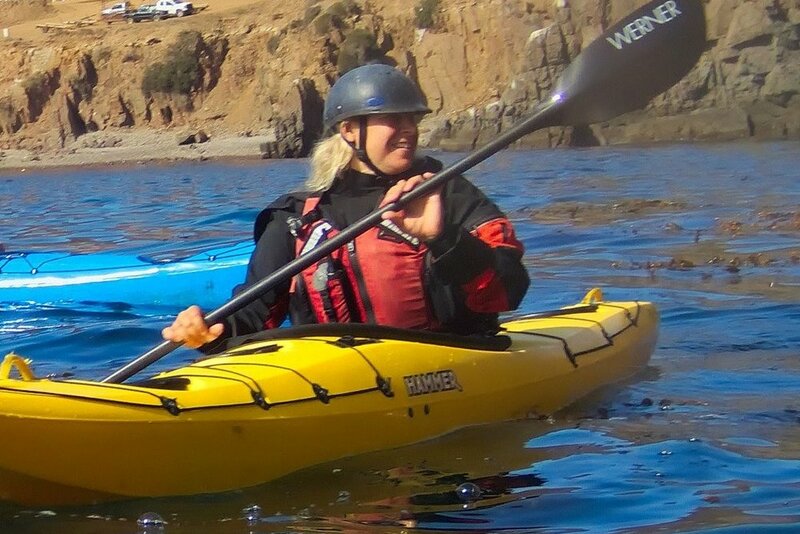 Jen loves to challenge herself with all types of kayaking: she has raced, competed in kayak surfing, run the Grand Canyon, and was a member of the 1999, 2000, and 2003 National Champion women’s kayak polo teams. Jen has enjoyed messing about in small boats since childhood in New Hampshire. She has a BA in geology from Colorado College and enjoys natural history of all sorts. Within a few minutes walk is a classic "tourist trap" of a market for all your entertainment and shopping needs! There are also several restaurants, taco stands, and a "mini-market" for beer and essentials. We will provide any transportation needed for the event. Clothes for paddling. Drysuits or wetsuits are appropriate, especially for rescue practice and serious rock garden play. The water will be in the high 50's to low 60's and the air temperature can vary - yearly average temps. HELMET. PROTECTIVE FOOTWEAR. Camping gear (if camping) such as a tent, sleeping bag & pad. There is a full kitchen, shower, and bathrooms adjacent to the camping. Sure, we're in Mexico, but it's not Mazatlan! The water will be 55-62 so drysuits are appropriate, especially for rescue practice! We expect experienced kayakers to be able to make good risk assessments regarding their clothing choices, but feel free to ask us for advice. The air temperature can vary significantly from warm and sunny to cool and foggy, so a variety of options is highly recommended! There will be areas for drying wet gear each evening and things tend to dry fast in the desert! Beaches and landings are rocky and slippery. Protective FOOTWEAR IS REQUIRED!! Helmets will be required. We will provide round trip transportation in one of our vehicles. It's an easy drive on good roads, If you would like to drive your own vehicle make sure you get Mexican auto insurance.